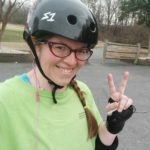 The Charlotte Roller Girls All-Stars and B Dazzlers will travel to Charleston, South Carolina, to do battle once more with the Low Country Highrollers All Stars and Bruisin’ Betties. 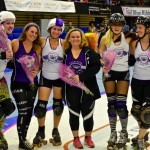 These teams have a shared history, both belonging to leagues that became full members of the WFTDA in 2011 and having faced each other on the track time and time again. On February 18, CLTRG once again hits the road for Charleston’s McAlister Field House to settle an old score. In their last head-to-head this past August the B Dazzlers skated home victorious, earning 106 points to the Bruisin’ Betties’ 85. This past game marked the second win for the B Dazzlers against the Betties. With freshly-minted players and a new line-up, can the B Dazzlers once again assert themselves in Lowcountry and bring home a third victory? The two league’s All-Stars teams faced off at the same games, but each time CLTRG suffered a narrow defeat. 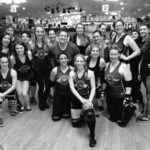 There’s no doubt that the Lowcountry Highrollers All-Stars are formidable opponents, but the Charlotte Roller Girls All-Stars have been finely honing their skills and strategy and are ready for some payback! Because both leagues earned their acceptance into the WFTDA East region last season, the outcome of this bout counts towards the teams’ rankings. The stakes have never been higher! Doors open at The Citadel’s McAllster Field House at 4:00. Tickets are $10 in advance and $14 at the door. Proceeds from the evening benefit We Are Family, a Charleston organization that provides local support and resources for gay, lesbian, bisexual, transgender, queer, questioning, intersex (GLBTQQI) youth and their straight allies.